This past weekend the Frick Art & Historical Center in Pittsburgh, PA celebrated the grand opening of its new Orientation Center ̶ the culmination of phase one of the master plan for improving visitor services on the museum campus. The event was also the kickoff for construction of the second phase: the expansion of the Frick Education Center and Car and Carriage Galleries and the addition of a new Community Center. The Frick is the recipient of a $3 million state grant to support these programs. 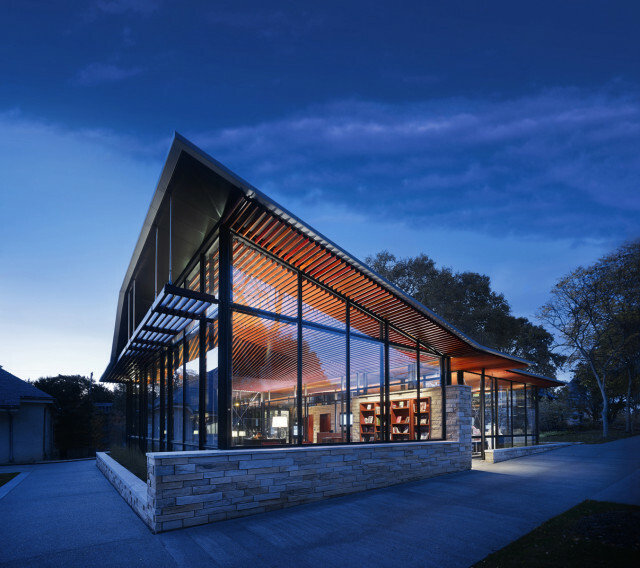 The Orientation Center is a glass-walled, 3000 sf building that provides a gathering point for tours, interactive displays for explorating the Frick and its collections, as well as visitor amenities such as the Museum Store and learning lounge. The building’s roof changes in pitch to reflect the shifting scale of buildings on campus, while detailing such as the herringbone laid tile flooring and cherrywood slatted ceiling treatment reference materials from Clayton, the museum’s historic estate.